Quinn and I are not among the throngs who celebrate Valentine’s Day. That day and all the chaos surrounding it have never appealed to me. Luckily, Quinn feels the same way. So, I’m not one to make heart-shaped baked goods. That doesn’t mean that I can’t indulge in one thing synonymous with Valentine’s Day – chocolate. While BoB is certainly no stranger to chocolate, it seems I never run out of chocolate recipes to try out. This particular one comes from Martha Stewart’s website via Everyday Food. Although I have far more cookbooks than I care to count, I find myself looking more and more toward the internet for recipes. Call it laziness or convenience, but most of the time I just find it’s easier to look that way than flip through a mountain of cookbooks. On with the cookies…. I can’t say enough good things about them. They are so very rich and delicious. If you’re a serious chocolate fan, then you should certainly try them out. Don’t be concerned about the consistency of the dough. It’s not like most cookie dough, but more like brownie batter. In fact, you may think there’s no way they’ll hold together. I love the look of these cookies. They have a crackled appearance, lighter on the outside with beautiful dark chocolate on the inside. As with those decadent brownies, I implore you to use the best chocolate you can. When baking something so utterly chocolate, it’s really worth it to use good ingredients. I used Ghiradelli chocolate for the dough and Guittard chocolate chunks. Heat chopped chocolate and butter in a microwave-safe bowl. Stir every 20 seconds until almost melted. Set aside. Whisk together flour, baking powder, and salt. In a separate bowl, beat eggs, brown sugar, and vanilla at high speed with an electric mixer. Mix until light and fluffy. Beat in melted chocolate. Mix in dry ingredients until just combined. Stir in chocolate chunks. Drop dough by heaping tablespoons onto baking sheets. Place 2-3 inches apart. Bake 12 to 15 minutes, or until cookies are shiny and crackly but soft in the center. Cool on baking sheets 10 minutes. Then, transfer to racks to cool completely. Holy molly… the shot of the eaten cookie made me drool in 2 seconds. those look sooo amazing… seriously! that’s what i want for valentine’s! I am looking at the half eaten cookie and hope that I could finish the remaining half! Happy Valentine’s Day! Those look wicked. In a good way! You had my attention from reading the name of the cookies! I appreciate when you also share bits of info…like the brand of choc used in these cookies. Aran and Mandy, Quinn was kind enough to make the sacrifice to get the half-eaten cookie. Thanks, Megan. You’re absolutely right. JEP, “outrageous” is definitely a good word for them. Amanda, they are certainly brownie-like. Very good indeed! Like brownie cookies! Oh – wow! Wow these look so yummy! I’m definitely going to have to try making them. Oh my these look so rich and decadent. I’d like a bite too please! Ooooo. I am drooling over the photos! This is already the second super chocolate recipe I see this morning I would love to try this week-end!!! I’m not usually a big fan of cookies but these photos have sold me – the crackled tops and gungey insides look gorgeous… definitely putting these on the to-bake list! Wow, these are breathtaking, Jen! I added that recipe to my del.icio.us a while ago but haven’t tried it yet – now I think I should do it soon! Yum! Those look very fudgy and chewy. I will definitely be trying those. I’ve been pretty pleased with most Martha recipes I’ve tried, this one looks like it hit the mark as well! I thought these looked good from the outside, but the photo that shows the middle makes me really want to eat some!! I think I would hurt myself with those. It wouldn’t be pretty. OMG !!! What is that ??? its driving me crazy … i need to have some now .Jennn ….. nowwww !!!!! Wow! Those look like fudgy bites of awesomeness! Evelin, Martha actually gave them the name “outrageous” to begin with, but I certainly agree with her. Ashley, I hope you like them! Meeta, I’m always glad to share! Francesco, let me know what you think if you try them. Indigo, maybe my eyes fail me, but it looks like you typed that you are “not usually a big fan of cookies.” Okay, I so don’t get that. 😉 These could definitely change your mind. Thanks, Patricia. Hope you like them! Alicia, I see that you understand that good things can happen when the ratio of sugar to flour is in favor of the sugar. Amy, all of Martha’s recipes I’ve tried for a while now have been excellent. She and I are getting along famously. 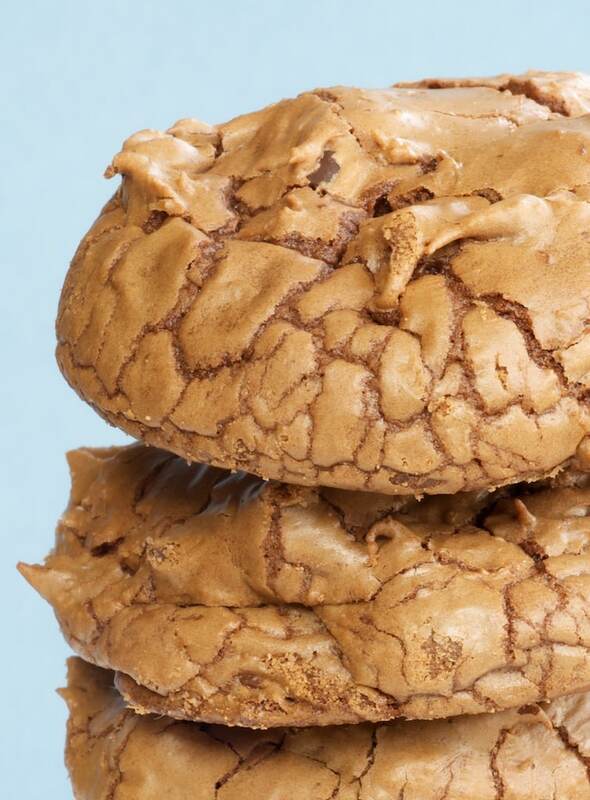 RecipeGirl, any cookie worthy of being called a “chocolate wow” has to be good. Deborah, the inside is really the payoff. So, so good. Joy, I would say that it would be easy to hurt yourself with these, but they’re so rich that I can only eat one at a time. Thanks, Brilynn! What a great description! These are making me drool!!! I am definitely making these ASAP!! Thanks for the great recipes and photos!! If stranded on a dessert island…these would totally do! Look at that cookie! I have bookmarked it for the cookie monster. We stay home on Valentine’s Day. I 3 roses for the first time in 10 years…that was a something!! oops I meant “deserted island”….see what they do to me?!!! Those look wonderful. I’m with you — I have lots of cookbooks but it’s easier to look on the internet for recipes. Terri, you’re welcome! Hope you like them. Tartelette, lol! And roses? How sweet! Tracy, with all the recipes on the internet, I sometimes wonder why I even buy cookbooks. But then I just laugh at myself and buy more. So after seeing these this morning I designated them as my baking project for the night. I made a half batch and subbed peanut butter chips for the chocolate chunks because my brother was begging for chocolate PB cookies. They’re great; I love the crackly tops and chewy texture. They don’t look nearly as pretty as yours though. 😛 Thanks for posting this! I made these yesterday and mine didn’t look a thing like your pictures! Mine came out flat and huge. What did I do wrong?! These look SO delicious! 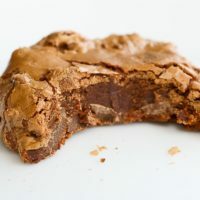 That chewy, fudgy inside has my name written all over it – bookmarked these to give them a try! That darn Martha Stewart! Who else would put out a recipe for a cookie that’s just as much a brownie? Talk about combining the best of both worlds! And which is better? Cookie? Brownie? Cookie Brownie? 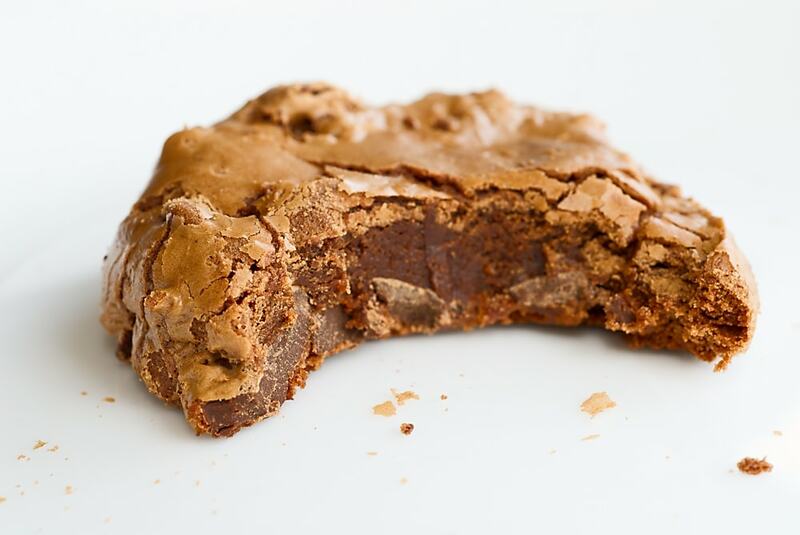 Uhhh… this cookie – you can have your brownie and eat it too! Holy cannolli those look amazing. I need to put this in my recipe file. Alicia, I’m glad you like them! Laura, maybe the dough was overmixed? That’s my first thought. Amy, let me know what you think after you make them. Cork & Feast, this cookie is the best of both worlds. Great for when you can’t decide whether to bake cookies or brownies. I hope you liked them! Cathy, these are certainly amazing. I may need to see if there are any left…. Those cookies look asolutely amazing. Great, great photos. A pure chocolate indulgence. I totally echo using the best chocolate – those Guittard chunks are quite heavenly. Jennifer, maybe he’s not quite developed a taste for darker chocolates. It took me a while. Glad you and your husband liked them! Kaykat, thanks. I think I’ve become a chocolate snob. Looks like you enjoyed them! Aren’t they wonderful? Oh My! Those are gorgeous. Thank you so much for sharing this recipe. I made them and wow, they were sooooo good! Very deep and chocolatey, loved them. My DH and I ate every single one!!! Thanks, Anna! I like your version, too. Jennifer, I’m glad you liked them! You have a great blog…love your recipes. I am going to do the mud slide recipe for my class in April. Thanks, Sally! Hope you like the Mud Slides. Oh My Goodness! These cookies look delicious! These look fantastic! 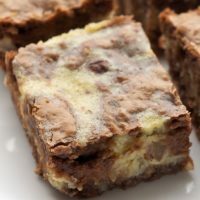 I’m going to make one batch normally, then switch things up by replacing the semisweet chocolate with white chocolate for the second (and perhaps substituting the vanilla for almond extract in the second batch, but I’m still debating that). Wish me luck! TetsujinWave, let me know how the white chocolate works. Sounds interesting! i am head over heels in love with these cookies! just the sight of their crackly and gooey apperance made me nearly speechless. I am going to make a batch of these as soon as possible. NIkki, I hope you like them! 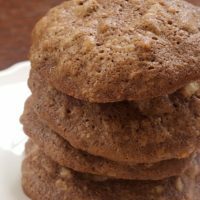 I tried making these cookies using Splenda brown blend. However, they turned out to be paper thin and they did not have a crackly surface. I followed every single step correctly. Could someone please tell me what the problem could be? Nikki, I’ve never baked with Splenda, but I would assume that’s what made the difference if that’s all that you changed with the recipe. I checked Splenda’s website and found this information that seems helpful. I made these amazing cookies last night during a desperate chocolate attack. They turned out absolutely delicous! I did follow two tips from other posters and I think that’s what made the difference for me. First, I really whipped the egg/brown sugar mixture and second, I let the batter sit in the fridge for 15 minutes before putting them on the cookie sheet. I didn’t have any chocolate chunks on hand, so I used white chocolate chips and they were devine. I will definately be baking these again! 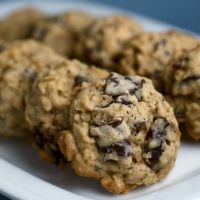 Did you take any of the suggestions the commenters left on the original (Martha) recipe site, such as chilling the dough for a bit before putting it on the cookie sheet? I had made these before finding the recipe on your site and mine came out very thin and flat… still, the taste is really fantastic. Dawn, for whatever reason, I really didn’t have much trouble with this dough. However, I think chilling the dough would probably help keep them nice and thick. cherry, you could try an egg substitute. I’ve had hit or miss results using that, but it’s worth a shot. unfortunately egg substitutes are not available back home. i was wondering whether plain yogurt or milk would do the trick. coz this cookies looks way too tempting to pass up. I made these over the weekend for a cookie swap and doubled the recipe. They were delicious! Rereading your post, I must have done some math wrong because my dough was super thick — almost too hard for my cookie scoops. FYI, I don’t think the Martha Stewart link works anymore. Love the cookies though. They were a hit with my family! Thanks, Dianna. I have fixed the link. 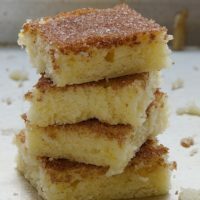 For those of you who’ve had trouble with the recipe link to Martha’s website, I’ve added the recipe to BoB and changed the link at the top of the post. Happy baking! Heeeeey. My question may be a bit off-topic, but the fact that I haven’t been able to answer it myself has been driving me crazy. Whenever I bake a batch of cookies that contains a substantial amount of cocoa powder, the dough seems to thin while the cookies are in the oven. Is it the cocoa, or should I be refrigerating the dough for at least an hour before I portion it into cookies? I would appreciate any advice that someone might have. These cookies looked so amazing I just had to try them… & they tasted just as amazing as they look! Quite possibly the best cookie I’ve ever had. I’m making them again today. Thanks! 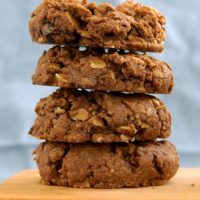 I Actually made these cookies and t first they came out super thin… the recipe only calls for 1/4 cup of flour which i believe is a mistake i added an additional cup of flour and the cookies turned outjust like the picture!!!!! so add 1 and 1/4 cups of flour! I made these 3 times now and if you want these to turn out you need to add additional flour or chances are they will be flat, trust me on this. Add like an additional 1/2 cup and let the batch stand for like 7-10 minutes. They are the best! I made these yesterday and they turned out flat as pancakes and did not turn out at all. I then looked up the recipe on martha stewarts page and found that the recipe on this site is wrong! it says 1/4 cup flour when martha uses 2/3 cups flour. I think that probably made the difference? Kenna, the original recipe I used had a different amount of flour, but Martha’s site now has 2/3 cups. I’ve updated the recipe on BoB, too. Don’t give up on these cookies, though. They are so worth the trouble! Thanks! I just made these for my family and, oh my gosh, they were SO good! some of the best cookies I’ve ever made! I thought they’d turn out flat so I froze them for about an hour and I think that helped a lot to give them the cakey yet crackly texture. I suggest this to people having issues. Thank you!! WOW, those look sooooo fudge-like!!! Just made these and they turned out terrifically! Thanks for the great recipe, I followed the recipe exactly but refrigerated for a few hours. The cookies were soft and chewy on the inside just like a brownie, yum delish! Hi, Haley. The dough is very different than traditional cookie dough, but they should hold their shape. Be sure not to overmix the dough. For the first ingredient can you use semisweet chocolate chips? Yes, Kathie, that will be fine. OMG … these look AMAZING!! The color is beautiful too!! I have to try these!! Great recipe. I just finished baking a batch – better a little bit undercooked – then the chocolate inside is just melting. Totally different if baked too long. 12 t- 13 minutes top. Hi, Steph. If you didn’t change anything about the recipe, then my guess is that the batter may have been overmixed. You can also try chilling the dough before scooping the cookies.